The ongoing protest by the Jat community in Haryana gave a scare to the Indian Railways in more ways than one. Apart from its trains damaged and stations being torched, the railway ministry was in a race against time to get its all-important Pink Book printed for the railway budget which gets presented on Thursday. The Pink Book has both ‘work in progress’ and ‘new work’ sections. The former lists projects approved in previous budgets and the latter lists new projects announced in the current budget. The book is a compilation of all individual projects approved by Parliament and the money sanctioned for them. It is tabled along with other railway budget documents. “Some of the papers on which it (Pink Book) is printed are stuck due to the Jat agitation. There are some other logistical issues which the Indian railways is trying to resolve given that some of the government-secured printing units are in those parts of the National Capital Region which are hit by the agitation,” said a senior railway ministry official requesting anonymity. The unrest by the community demanding reservation in government jobs has already hit the Indian railways with damages totalling to at least Rs200 crore. It has affected running of almost 1,000 trains and more than 1 million passengers. To be sure, officials involved in the budget making process were working overtime to get the Pink Book printed. “There are some projects which the railways probably will never do but were included due to, say, political pressure. These projects keep recurring and remain in the Pink Book till they are allocated funds and completed,” said a railway ministry official requesting anonymity. Given that the sanctions made in the railway minister’s speech could be higher with the actual allocation being low, the voluminous document of around 1,000 pages shows the actual intent of the railway ministry towards those specific projects. Usually all the budget documents are printed at least one week before the presentation of the railway budget. Not necessarily all these documents go for printing together at the same unit unlike the Union budget documents which are all printed in the unit in the basement of the North Block. Queries emailed to the Railway ministry spokesperson on 23 February remained unanswered. 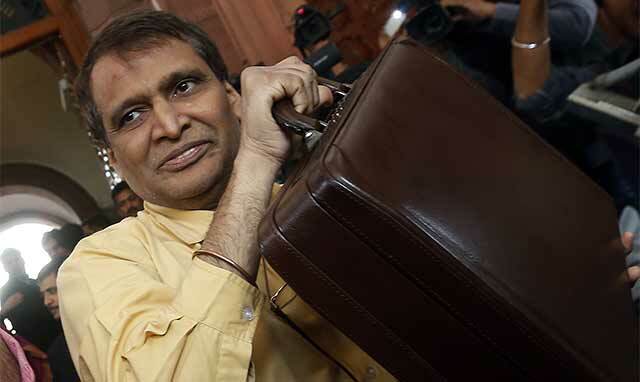 Railway minister Suresh Prabhu will present the budget in Parliament on 25 February. The railway budget of 2015 envisaged an investment of Rs8.5 trillion in next five years. “Earlier around 6,000 copies used to be printed (of the pink book) as it goes to various stakeholders, but the minister (Prabhu) has brought it down to just 3,000 copies,” said the first railway ministry official quoted above. Given that the last railway budget made numerous promises, this year’s budget is expected to consolidate on them and talk about structural interventions required to implement them.